St. Charles is now available at $1,350,000. or call us today at: 630-584-6700. 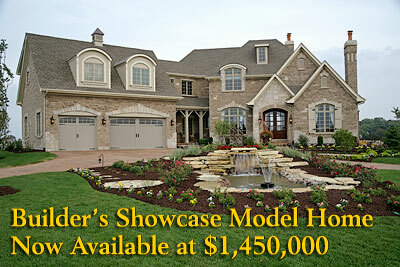 Our Versailles Model Home is Now Available! St. Charles is now available at $1,450,000. 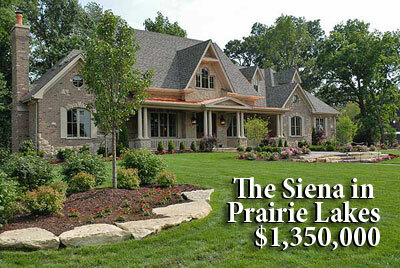 Phase 2 Lots at Prairie Lakes in St. Charles are now available for your new luxury home from Silvestri Custom Homes. This development will feature large lots, single story homes start at 3,000 square feet, two-story homes start at 3,800 square feet. Prices will range from $850,000 to $1,200,000 and above. For more details on this new development, please visit: Prairie Lakes. Home and lot packages from the $650,000's to over $800,000. For more details on this new development, please visit: Blackberry Ridge or call us at 630-584-6700. Designs, specifications, pricing and other information is subject to change without notice.